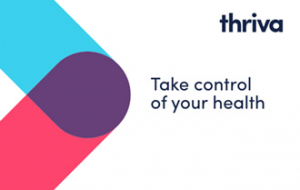 Thriva is the world's first preventative healthcare service. We've made it incredibly easy to find out how your body is really doing. Our simple, painless finger-prick blood testing kits are used at home with results within 48 hours. You'll see your heart attack and diabetes risk, vitamin D and B12 deficiency and many others. Select the Thriva health check you’d like to use and enter your code at checkout to receive your discounted first test. After ordering your kit you can chose when you’d like your next test. This card expires in 2 years. A gift card can only be used once. Gift cards can be used any time within 2 years of purchase. Those existing Thriva customers who have account credit with Thriva can also use gift cards to further reduce the cost of their purchase. The use of this gift card does not affect your statutory rights.